Federal agencies would see drastically reduced spending levels and their employees would see smaller paychecks thanks to higher retirement pension contributions under a fiscal 2020 budget proposal put forward by Senate Republicans on Friday. 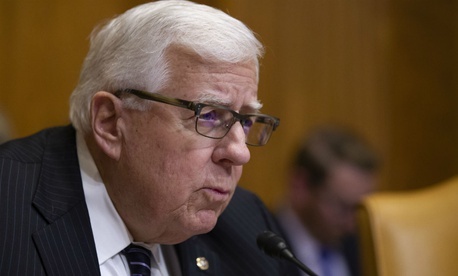 The proposal, unveiled by Senate Budget Committee Chairman Sen. Mike Enzi, R-Wyo., would slash discretionary spending at non-defense agencies by 9 percent next fiscal year. The $55 billion reduction would bring spending in line with statutory caps established by the 2011 Budget Control Act and exceed the 5 percent cuts proposed by President Trump in his fiscal 2020 blueprint. Senate Republicans would allow for an adjustment to those caps, however, as Congress has elected to do for the last six years through three bipartisan budget deals. The resolution would create a “reserve fund” to raise the spending caps, provided lawmakers find ways to offset the increase over a 10-year period. Enzi would then be able to raise the allocations provided to each funding category. As the proposal currently stands, non-defense agencies would receive $542 billion in fiscal 2020. That would climb to $555 billion in fiscal 2021 but stay flat for the next three years. Absent a budget deal, Enzi also proposed a 10 percent cut to defense spending next year. The measure would also seek to increase revenues by $176 billion over the next five years, in part by raising federal employees’ contributions to their retirement pensions. Trump proposed a similar reform in his fiscal 2020 budget, suggesting feds gradually contribute more toward the benefit until they account for half of the cost. House Republicans have for years pushed a similar change. Republicans would also instruct the Senate Homeland Security and Governmental Affairs Committee to reduce the deficit by $15 billion, which typically includes federal workforce compensation reforms. Enzi’s committee will mark up the resolution next week.